FLINT, Mich. (AP) — Five people, including the head of Michigan’s health department, were charged Wednesday with involuntary manslaughter in an investigation of Flint’s lead-contaminated water, all blamed in the death of an 85-year-old man who had Legionnaires’ disease. Nick Lyon is the highest-ranking member of Republican Gov. Rick Snyder’s administration to be snagged in a criminal investigation of how the city’s water system became poisoned after officials tapped the Flint River in 2014. Lyon, 48, the director of the Health and Human Services Department, is accused of failing to alert the majority-black population about an outbreak of Legionnaires’ disease in the Flint area, which has been linked by some experts to poor water quality in 2014-15. 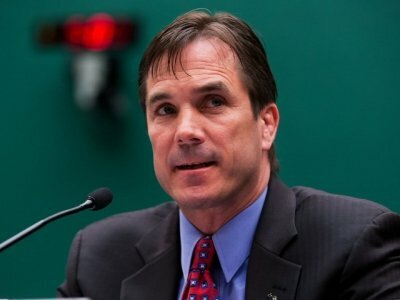 “The health crisis in Flint has created a trust crisis for Michigan government, exposing a serious lack of confidence in leaders who accept responsibility and solve problems,” said state Attorney General Bill Schuette, who said his probe is moving to the trial phase and signaled that Snyder, who has apologized for his administration’s failures that led to and prolonged the crisis, may not be charged. “We only file criminal charges when evidence of probable cause of a crime has been established. And we’re not filing charges at this time,” he said. The others charged with involuntary manslaughter were already facing other charges. They are: Darnell Earley, who was Flint’s emergency manager when the city used the river; Howard Croft, who ran Flint’s public works department; Liane Shekter Smith; and Stephen Busch. Shekter Smith and Busch were state environmental regulators. Prosecutors also brought charges Wednesday against a sixth person — the state’s chief medical officer, Dr. Eden Wells, 54, who is accused of obstruction of justice and lying to an investigator. “The true facts simply do not support the prosecution’s claims,” they said in a statement. Convincing a jury that the officials’ failure to disclose the risk of Legionnaires’ disease caused a death would be difficult, Wayne State University law professor Peter Henning said. Lyon was personally briefed in January 2015 but “took no action to alert the public of a deadly” outbreak until nearly a year later, special agent Jeff Seipenko told a judge as the charges were filed. Lyon has admitted that he was aware of the Legionnaires’ outbreak for months but wanted to delay saying anything public until state Health and Human Services Department investigators finished their own probe. Learning that Legionnaires’ disease caused Robert Skidmore’s death didn’t sit well with his family, grandson Craig Skidmore told The Associated Press Wednesday. “Everybody was pretty upset, rightfully, finding out this could be the reason that he died,” Craig Skidmore said. Schuette has now charged 15 current or former government officials in an ongoing probe that began in early 2016, including two emergency managers whom Snyder appointed to run the impoverished city of roughly 100,000 residents. The Michigan Civil Rights Commission issued a report in February blaming “systemic racism” going back decades for the problems that caused the water crisis in Flint. Associated Press writers John Flesher in Traverse City and Ed White and Corey Williams in Detroit contributed to this report.